Allister Grant Morden is a great-grandson of Alvey Morden, founder of Morden, after whom the town is named. The Boundary Commission Trail spanned southern Manitoba from a point near Emerson to the western border beyond Antler Creek and Lyleton. Many settlers from Ontario came over this trail to the Morden - Nelsonville area, and here they took up land on which good stands of trees provided lumber for cabins, barns, fences and firewood, all important items in the minds of the settlers from Canada's eastern woodlands. Most of the settlers who came to the Morden - Nelsonville area in 1874, had entered the province from the south, coming to West Lynne (Emerson) by sternwheel steamers. From there they struck westward over the Boundary Commission Trail to the site of Mountain City, and northward from there followed a well worn but unnamed trail which skirted the valley of Cheval [Deadhorse] Creek. At the present site of Morden, the trail dipped down to a shallow ford which was easily crossed except when the creek was flush with the spring runoff. 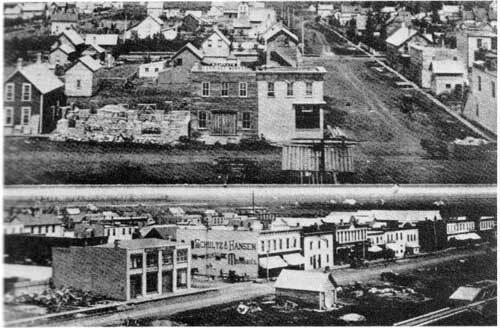 Two views of the Village of Morden taken in 1893 from the top of McBean's elevator, the site of the present Shell Oil Station. The upper photo looks north along Nelson Street. Note the meandering ox cart trail. The lower photo looks northeast along Railway Street, on which not one original place of business remains today. The ford was clearly visible in the 1960s, but the dredging of the stream at this point and the straightening of its course have erased the crossing. When I was quite young I visited the ford many times and made a point of examining it. Today, the trail which led to it from the south may be traced through a growth of new shrubbery. Shortly after his arrival in this area in 1874, my great-grandfather, Alvey Morden, bought the NE ¼ of 6-3-5W on which the ford was located. Through his son, Franklin Morden (my grandfather), who homesteaded the adjacent quarter-section, and lived there most his life, I had heard frequent mention of the ford on my great-grandfather's farm. My Father, John A. Morden, the first white child born in what was to become the village of Morden, was well acquainted with the ford and the trail, both of which were but a short walk west of Alvey Morden's home. The survey of the west occurred in 1870, and the first rush of settlers into the Pembina Hills came four years later. So when James Conner homesteaded the SW6-3-5, he found the highway of the day skirting his farm. It was natural therefore that he should build his log house close to this artery, even if it was in the centre of the section and far from the road allowances where future roads would run. Nonetheless, the site was a good one, and James Conner's home became the local post office, Minnewashta P.O. *, which served the district from 1878 to 1884.